All information contained within this post was gathered from social media & aircraft tracking websites only, no radio intercepts were made by EGXWinfo Group and none of the social media sources have claimed to be in any way connected to the RAF/MOD – Should any official body be concerned with the information contained within this or any other post please contact us urgently using this form, providing an official email address for verification. 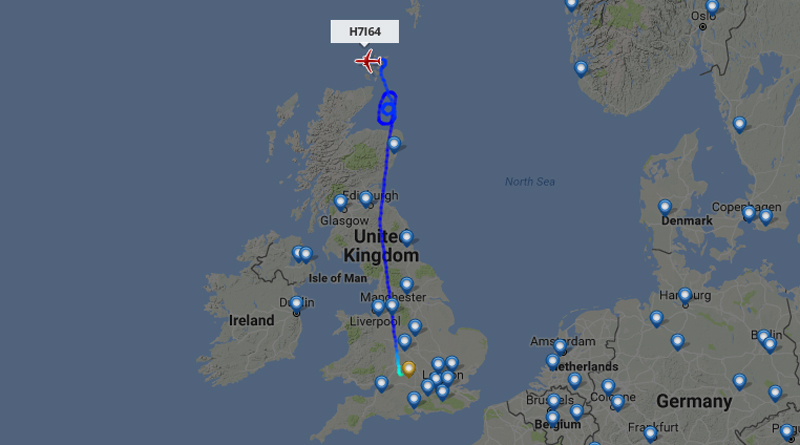 Looks like there is an Active QRA from UK North (RAF Lossiemouth) Tanker “H7I64” ZZ336 Squawk of 1321 seen up near Lossiemouth, took off from Brize Norton around 2120L. Obviously there will be at least a pair of Typhoons up there somewhere from Lossie however we believe they are not using Mode-S as nothing has been logged by any of the listening posts/tracking services we can access. Typhoon callsigns seem to be either “9MP11” and/or “0MP11”. Seems the second jet may have gone U/S so a Third was started up, takeoff of at least one around 2229L. 0059L: Just found some reports on social media suggesting the Typhoons RTB’ed to Lossie about 20mins ago. Tanker back in the more southern Temp AARA it established earlier.